A former soldier who alerted police to a bomb and weapons cache at Paris' biggest international airport has himself been taken into custody. The man raised the alarm when he said he saw a weapon in the car of an airport baggage handler at Roissy-Charles de Gaulle airport. Police confirmed on Tuesday that the ex-soldier had himself been detained for questioning on his account of what happened. The baggage handler, Abderazak Besseghir, was arrested when he returned to the car. Police found plastic explosives, detonators, a fuse, a machine gun and an automatic pistol in the boot. He has refused to answer nearly all questions put to him, except to claim that he is the victim of a set-up, possibly by a member of his family seeking revenge against him. French media reports say his wife's family blame him for her death in a fire, and he believes he has been the victim of a plot to frame him. The former soldier is believed to have told police he saw Mr Besseghir moving items in the car boot, and heard strange noises. "Investigators are trying to check the credibility and the veracity of his statements, in addition to establishing his personality profile," said a police official. Taking a witness into custody is an unusual step, correspondents say. Mr Besseghir, a 27-year-old Frenchman of Algerian origin, is not known to have any links to extremist groups, although correspondents say the possibility of a terrorist connection with Islamic militants will be closely examined. He has told police that someone else must have put the arms cache in the vehicle, to frame him, as he had never seen the guns and explosives before. One report said radical Islamic and pro-Palestinian material was also found in the car, along with information about pilots' uniforms. Police say the bomb components found in the car were ready to use, but have been puzzled as to exactly what they might have been used for. "He certainly wasn't going mushroom picking," one investigator has said. If some kind of terror attack was being planned, police will want to establish whether it was a hijacking or an assault on the airport itself. The other line of inquiry will be whether there was a purely criminal motive behind the weapons and explosives cache - or whether Mr Besseghir's claims to have been framed are true. The firm which employed Mr Besseghir said he had worked at the airport for three years without giving any grounds for suspicion. He had no criminal record, although had reportedly been involved in a vandalism incident five years ago. Like other baggage handlers, he had security clearance for a number of restricted zones at the airport. 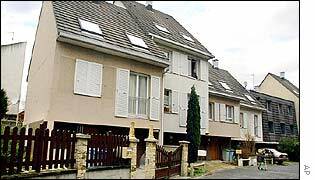 Mr Besseghir's father, two brothers and a family friend have also been taken in for questioning, and his home in the northern Parisian suburb of Bondy has been searched. Mr Besseghir can be held for up to four days without charge. Paris police have made several arrests in the past two weeks of suspected Islamic militants. The authorities say some were planning an attack on the Russian embassy in the city. Police said before Christmas that they had found bomb-making equipment during raids in the Paris suburbs. In total, nine arrests have been made since 16 December. All those arrested are said to be of Algerian or Moroccan origin. The arrests stem from an investigation into possible connections between Islamic militants in Europe and Chechnya. "The baggage handler says he's never seen the guns and explosives before"